With this contest, every finalist was a winner. 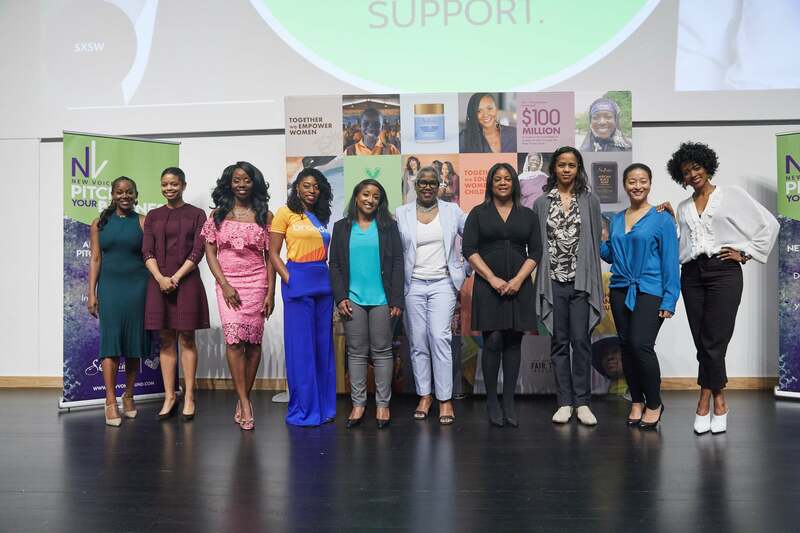 On March 9, ten Black women entrepreneurs gathered at the 22nd annual South by Southwest (SXSW) conference for Pitch Black—a pitch contest presented by MVMT50; SheaMoisture; and New Voices Foundation, founded by ESSENCE Ventures Chair Richelieu Dennis. These finalists were selected from more than 320 hopefuls–the largest number of submissions for both MVMT50 and New Voices Foundation pitch events—to win $105,000. Over the weekend, the competition awarded all ten finalists a portion of the $105,000 prize money—every woman was a winner. “The interest that entrepreneurs have shown in our New Voices pitch competitions is indicative of the critical need for development opportunities and access to capital and other resources that women of color–led businesses need to level the playing field and ultimately to thrive,” said Dennis in a statement. New Voices Foundation is just one of many ventures Dennis is a part of. Since purchasing ESSENCE in 2018, he has launched a number of projects and initiatives in support of Black women entrepreneurs. In July 2018, the SheaMoisture founder announced the ESSENCE Makers and Creators Fund, which will invest $20 million in Black creators and makers. Queen Latifah’s company, Flavor Unit Entertainment, is also the first partner. To learn more about the ten finalists and their awards, check out below! Overview: Partake Foods makes delicious, nutritious, allergy-friendly meals and snacks that provide peace of mind to those with dietary restrictions and simple enjoyment to those without. Overview: ShearShare connects salon and barbershop owners to licensed stylists to fill unused suites and stations on demand. Salon and barbershop owners make money on their empty chairs. Licensed cosmetologists and barbers find professional space to work by the day. Overview: NeuroVice is an innovative company developing a new, disruptive medical device technology that improves the patient experience. Overview: Go Together developed a secure, interactive school-branded transit app for carpools, walking pools, bike pools, urban mass transit and personalized trip service. Overview: GlamTech provides machine learning, computer vision, and augmented reality enterprise software technology solutions to skincare companies and dermatologists. Overview: Geospatial Collaborative is a consulting firm that works with communities and populations to re-imagine strategies, programs, and services to spur social innovation that improves quality of life. Overview: Brandire, a marketing company that uses a multidisciplinary approach that helps customers increase brand awareness, customer engagement and revenue through powerful storytelling. Overview: TruDIary is a telehealth platform designed to help millennial women create a personalized medical chart based on insights, moods, behaviors, symptoms and family medical history. Overview: Early Aware provides a tech solution that informs first responders about people who have a mental health or physical disability before and during an emergency. Overview: The Difference connects users with a licensed, human therapist via app, phone or smart speaker within 30 minutes or less.